Need help gettin' your Crew into heaps of trouble? THINGS DON'T GO SMOOTH expands the 'Verse with a passel of characters and shiny new rules like scene and location triggers. Perfect for an upstanding GM like yourself! 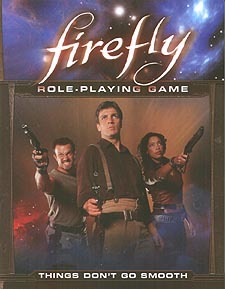 To use what you find in THINGS DON'T GO SMOOTH, you'll need a copy of the FIREFLY ROLE-PLAYING GAME. NEW VILLAINS AND VARMINTS Meet spies & crime bosses, rival crews, the unexplained, and more! PACKED WITH GM ADVICE AND RULES Find advice on Reavers and an Episode generator. Filled with new Distinctions, triggers, and more. TWO NEW FULL_LENGTH ADVENTURES Introduce your new Antagonists and rules with "Merciless" and "Thieves in Heaven"